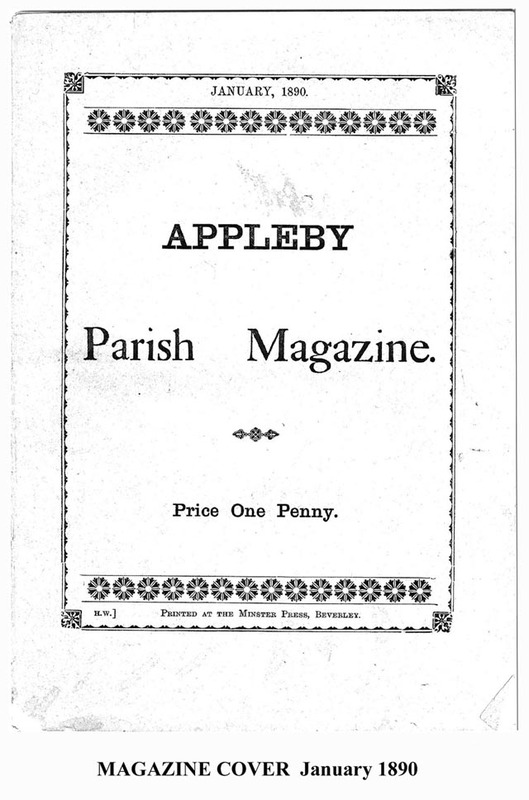 The survival of Parish Magazines from the 1880s and 1890s provides a fascinating window into the life of the village of Appleby Magna, together with Appleby Parva, in the late Victorian era. 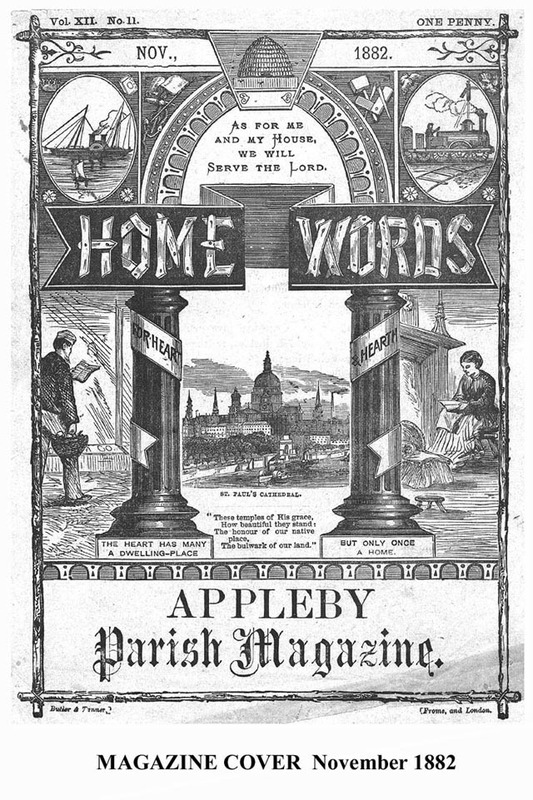 Each edition of the magazine was bound with Home Words for Heart and Hearth a church monthly magazine produced by Revd Charles Bullock and published by the Minster Press at Beverley. The patronage of Appleby Church was held during this period by the squire of Appleby, George John Moore of Appleby Hall. In 1877, the long-serving Rector Revd J.M. Echalaz had died and the squire appointed his own younger brother Revd Charles Thomas Moore to the Rectory. Rector Moore was 30 years of age and was himself to remain rector until retirement in 1922. He died in 1924. Effectively he became squire as well as rector from about 1880, following the temporary withdrawal of his brother from Appleby Hall when the estate underwent severe financial difficulties. With his love of hunting and rural pursuits the word ‘squarson’ could have been coined for C.T.Moore personally. But C.T.Moore has had a ‘bad press’. His clash with the difficult John Wakeford, Archdeacon of Stow resulted firstly in Moore’s Consistory Court trial in 1915 for ‘immoral conduct’ - from which he was acquitted - an action for which he was convinced the archdeacon was covertly responsible and on which he blamed his wife’s consequent stroke and continuing illness. Subsequently, in 1920, Archdeacon Wakeford was himself charged with immorality - and found guilty. By coincidence, one of C.T.Moore’s closest friends and fellow huntsman was Revd Herbert Worthington, Rector of Netherseal. Wakeford was married to Worthington’s sister and Worthington believed that Wakeford was treating her badly. Detractors of Moore hold that he and Worthington together cooked up the case against Wakeford in retaliation for what they perceived as Wakeford’s malice towards them. Readers wishing to learn more of this intrigue are referred to John Treherne’s Dangerous Precincts(published by Jonathan Cape, 1987). It is therefore refreshing to observe another side to Rector Moore’s life as, in these earlier times, he carried out his duties in the parish. The magazines, which he edited, unwittingly record his involvement with not only the village church, but also the three schools: the Grammar School and the Boys and Girls Elementary Schools with reports on their pupils’ progress. 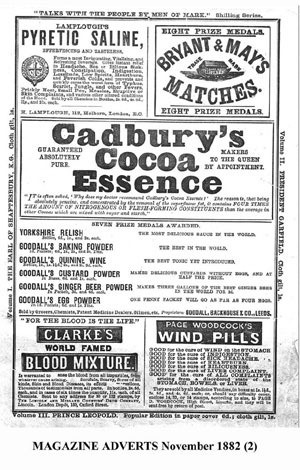 Social, economic and political conditions of the time are apparent from the references to clothing, coal and shoe clubs; the distribution of beef and coal to the needy at Christmas time; and the organisation by ‘Mr Moore’ (probably the squire after overcoming his financial problems) of a village meeting to hear about the advantages of ‘Fair Trade’ - i.e. Free Trade conditional upon reciprocity. Children were entertained with magic lantern shows which encompassed both edifying and amusing subjects. The allotment garden, cottage garden and flower shows and competitions are detailed. Annual dinners (very popular) of various organisations were reported: the cricket club, the church choir and the Appleby Association for the Prosecution of Felons (the local Victorian equivalent of Neighbourhood Watch?). The Original Friendly Society and the Loyal George Moore Lodge of Oddfellows held their annual Whit Monday Walks. 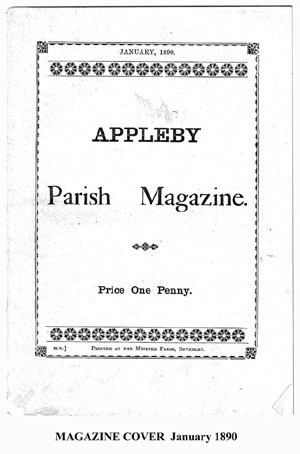 The Rector encouraged all of these groups and their activities were regularly recorded in the parish magazines. 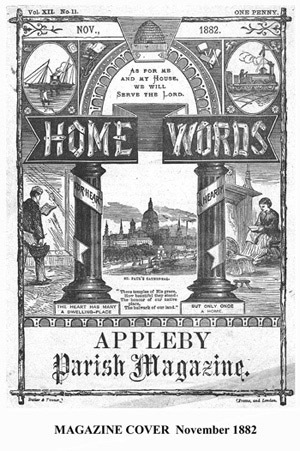 In addition to Rector Moore, other notables mentioned in the magazines include his wife Mrs Mabel Charlotte Moore, née Byron; the Revd Willam S.Bamber, headmaster of the Grammar School until his untimely death in 1891, and who acted in many ways as the Rector’s unofficial curate; and Mr William Riley, headmaster of the Boys Elementary School and organist and choir master of Appleby Church. With the exceptions of minor corrections to spelling and the layout of lists, the extracts are reproduced verbatim. 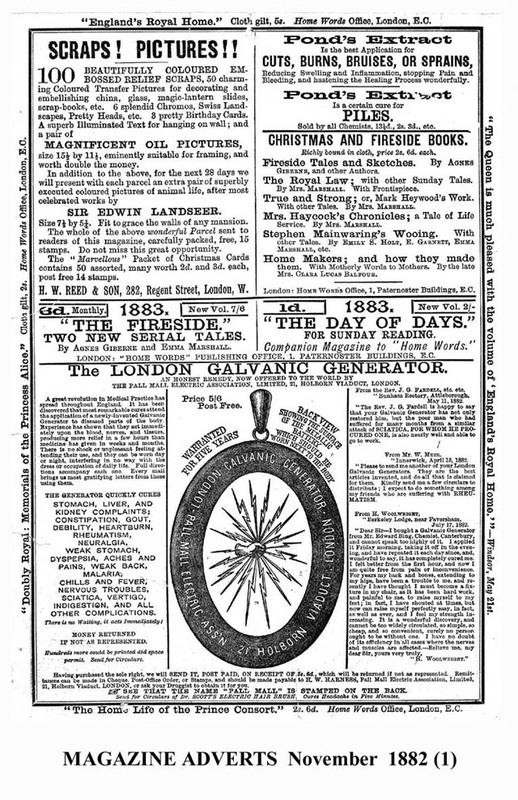 Where appropriate main topics in the extracts which follow have been printed in bold type. Note. A version of this article was published in Hinckley Historian 43, Spring 1999. The original magazines were subsequently deposited at the Leicestershire Record Office, Ref. DE 5566. The Annual Harvest Thanksgiving Services took place on the 1st of last month. The church was most tastefully decorated by the ladies of the parish; the parishioners having kindly helped them by contributions of corn, fruit and flowers, etc. The Sermon at the Evening Service was preached by the Rev. W.S. Bamber. The choir sang the anthem, “I will lift up mine eyes unto the hills,” and hymns suitable for the occasion. The collection amounted to the sum of £8 3s. 2d. which was duly forwarded to the Infirmary at Leicester. The Mothers’ Meetings, which seemed to give general satisfaction last winter, will re-commence on Tuesday, the 7th instant, in the Girls’ National Schoolroom [now the larger room in the Church Hall]. It will greatly tend to the well-being of these meetings, and to the general convenience, if those who desire to join will, even if they may not be able to be present at the first meeting, at least send in their names at that time as wishing to become members. After this month no fresh members can be admitted. Members of the Clothing and Coal Clubs are reminded that Monday, the 6th instant, is the last day for paying in. The club cards will be given out on the Monday following, at 12 o’clock, at the Girls Schoolroom. On Tuesday, November 11th, the Diocesan Inspector, the Rev. F.Bell, made his Annual Inspection of the Girls’, and Infants’, and Boys’ Schools, and we are glad to say that his Report is a fairly satisfactory one. The Mothers’ Meetings will commence again on Tuesday, December 2nd, at the Rooms at Mr. E. Tunnadine’s. The Meetings will take place every Tuesday as before, from Two to Four, p.m., during Winter Months. The Shoe Club in connection with the Sunday School will re-open on the First Sunday in the New Year. During Advent there will be Divine Service at the Parish Church each Friday Evening at Seven p.m. when Sermons will be preached on: Friday December 5th, by Rev. C. Moore; 12th, by Rev. E. Williams, Cleobury Mortimer, Salop; 19th, by Rev. W. Bamber. The following have been successful in gaining Prizes, in connection with the Day School. Girls and Infants: Fanny Garratt, Annie Wyatt, Alfred Insley, James Gresley, Aaron Chandler, Harry Garratt, Philip Booton, Nellie Clark. The above gained the requisite number of marks and passed the Inspection. The Christmas season passed off rather quietly in our village, nothing of unusual interest occurring. The Parish church was very effectively decorated according to custom with berried holly and other evergreens, and great thanks are given to those kind friends who assisted. We were glad to see so many at the early Celebration of Holy Communion. The Sermon at the Morning Service was preached by Rev. W. Bamber. After the Afternoon Service the charity bequeathed by Abraham Mould was distributed to ten recipients, after which, buns and oranges were given to the Sunday School children by the Rector, and some nice packets of bon-bons and oranges by Mrs. Moore. The usual presents of beef and coal have been given to some of the aged poor and widows, all of whom seemed to appreciate the gift. 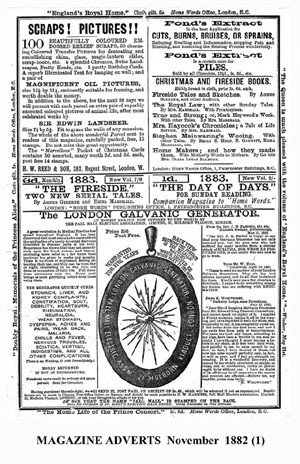 On Jan. 21st, a Magic Lantern Entertainment was held in the Girls’ National School, in aid of the Crippled Boy’s Home, Kensington. A series of interesting slides were shown by Mr. Maxtead, depicting scenes from John Ploughman’s sayings, and afterwards some pictures of a more comic description were exhibited. The amount forwarded to the Crippled Boy’s Home, after expenses were paid, was £2. The Clothing and Coal Club will again re-open on the first Monday in February. Payments should be made at the Girls’ National School at 12 o’clock, noon. It has been decided that the Cottage Garden Show shall be held this year on Wednesday, August 6th. Prizes will also be offered for the best cultivated gardens, probably in two classes. It is earnestly hoped that all who are interested will give the Show their utmost support, in order to enable the Committee to effect some much needed improvements, to offer suitable prizes, and to ensure the greater stability and success of the Show. Further information will appear from time to time in this Magazine, and can also be obtained from the Secretary, Mr. G. German. On Thursday, February 6th, a supper was given by Mr. Moore to the labourers and miners of the village, in the large club room at the Moore Arms Inn [now the Appleby Inn Hotel]. All were invited without respect to religious views or political opinion. After supper the meeting was thrown open to the farmers, tradesmen and others. The chair was taken by Mr. Moore who in a short speech spoke of the depressed state of agriculture. Mr. Pettifer who had been announced to give an address on the “Advantages of Fair Trade” was then introduced by the chairman and after the address which lasted a little over half an hour, a number of questions were asked and answered, and a very pleasant evening terminated with a vote of thanks to the lecturer and the chairman. On the same evening the children of the village schools were entertained at the Grammar School by the Rev. W. and Mrs. Bamber. Refreshments were provided, and an interesting and instructive magic lantern exhibition was given by the Rev. H. W. Orford, Rector of Bradden and formerly second Master of the Grammar School. About 120 children were present who seemed thoroughly to enjoy themselves. On Monday, February 10th, the Rev. C Moore, Rector of the Parish entertained the members of the Church Choir at dinner at the Moore Arms Inn. Some other friends were also invited, the Rector presided, supported on his right by the Rev. W. Bamber. After the loyal toasts had been given by the chairman; Mr. Bamber proposed success to the Church Choir to which Mr. W. Riley, the organist suitably responded, and concluded by giving the health of the Rector of the Parish which was cordially received. After other toasts some excellent songs were given by the members and ex-members of the Choir and a pleasant evening was spent. It has been decided to hold the Cottage Garden Show this year on August 6th. There will be two classes for the best cultivated gardens. It is intended to offer three prizes in each class. The classes will be described as follows. Class open to agricultural labourers and miners. Class open for jobbing and under gardeners, gentlemans’ servants, police constables, carriers, game keepers, dealers, postmen, and tradesmen. The gardens will be inspected by the judges probably sometime in June, July and August. A few alterations will be made in the prize schedule the most important of which are. In Class I, it is proposed to give three prizes for each of the following, viz., potatoes, peas, long-pod beans, vegetable marrows, carrots, turnips, August onions. Two prizes for white cabbage and cauliflower and omit savoy cabbage. In Class II, Amateurs. Prizes of equal value of those now given will be offered for the best collection of flowers (roses excluded). In Class III, Children. It is proposed to give four prizes where three are now given. In Class, open to all comers, it is intended to offer prizes of equal value with those now given, two prizes for the best collection of fruit, and two prizes for the best dozen roses. The Cricket Club, which was so successfully re-organized last year, has already commenced its season. Two matches have already been played, and although one was drawn, and in the other the club suffered defeat, we feel sure that as the season advances the club will hold its own. With Mr. W. Parker as captain, and Mr. W. Riley secretary, we feel confident bright days are in store, and we recommend all those who are fond of the game and who have not joined, to do so at once. We have great pleasure in informing our readers that it is the intention of the Old Original and the Odd Fellows Friendly Societies to “walk” on Whit-Monday. We understand that the Clubs will walk in procession together, attend Divine Service at the Parish Church, and then proceed to the Anniversary dinner at the Moore Arms. There will be Divine Service on Ascension Day, due notice of which will be announced. After the service the procession was again formed, and the Clubs, headed by the Band, walked to the Moore Arms Inn, where a substantial dinner was provided by Mr. J. W. Bowley. A special feature in the procession this year was the admission of a number of the very Juvenile Members of the Oddfellows, and we commend this step as being one in quite the right direction. After dinner the usual loyal toasts were given from the Chair; then the principal toast, “Prosperity to the two Clubs,” was duly submitted and responded to, and a pleasant day was spent. Owing to unforeseen circumstances it has been found necessary to alter the date of the Cottage Garden Show to Friday, August 1st. The Exhibition will this year, by kind permission of the Rev. W. Bamber, be held in the grounds of the Grammar School. The Annual Inspection of these Schools [by H.M. Inspector, Mr. Haslam] took place on July 4th, and from the report of the Girls’ School since received from the Education Department, we are glad to state that the School is highly efficient. The report states that the girls and infants have acquitted themselves very creditably, that they are in excellent order, and have been well taught. It is only due to mention that in the Girls’ School, in the Standards, there was not a single failure. The result must be extremely satisfactory to the parents of the children, and reflects great credit upon the Teachers. The Report of the Boys’ School had not been received at the time of our going to press. From the Annual Grammar School Report we gather that two boys who went up to Cambridge last October are doing very satisfactorily. F. W. Groome, of St. John’s, has gained exhibitions, &c. (including one of the Goldsmith’s Company’s Exhibitions), of the value of about £110 per annum. J. H. Glover has received a small exhibition in addition to the sub-sizarship [scholarship], which he gained last year at Trinity College. As a result of the School Examination, the following boys have gained prizes. Form VI., J. J. Robinson (who is proceeding to Cambridge in October); A. J. Stanley, F.C. Stevenson. Form V., Ivan Jackson. Form IV., Upton I., and Ratcliffe. Form III., Tagge II., Lester, and Upton II. Form II., none. Several boys have passed various examinations - the Senior Local, the Junior Local, or (in part) the Preliminary as Medical Students. The Appleby Association The Annual Dinner of the Appleby Association for the Prosecution of Felons, &c., took place on Nov. 11th, at the Crown Inn. There was a large attendance of members, and an excellent dinner was provided by Mr. Saddington. The Rev. W. S. Bamber presided. The Rector was re-elected Treasurer; and Mr. J. Price was succeeded as Secretary by Mr. Geo. Reeves. An allowance was granted to Mr. A. Chandler to meet his expenses in prosecuting a dishonest assistant. Mr. C. Bates, Mr. E. W. Price, and Mr. E. Farmer were elected members. A very pleasant evening was spent, toast and song succeeding each other. The Annual dinner of the Cricket club was held at the Moore’s Arms, on Oct. 24th. The company numbered twenty-two and sat down to an ample repast provided by Mr. and Mrs. W. Bowley. In the absence of the President and Vice Presidents, the Chair was taken by Mr. Varnam. After the usual loyal toasts had been duly honoured, the Secretary gave a statement which showed that during the year 14 matches had been played of which 6 were won, 4 lost, and 4 drawn. Financially the club is in a healthy state, having a balance in hand of £4 17s. 5d. During the evening the Chairman presented Mr. G Lowe with a bat given by the Squire for his best average of 24. Mr. J. Lowe was second with 20; Mr. Robinson third with 15, and Mr. Frederick 4th with an average of 10. Mr. G. Lowe was also first for the best bowling average and thus wins the ball given by Mrs. Moore. The health of the Squire was heartily received, and also that of Mr. Varnam, who has done so much for the Club in allowing the use of the ground free. The evening was spent very pleasantly, and much enlivened with several capital songs. As the Cricket Season is now commencing, our readers will be glad to know that the Club has arranged a series of matches. The Club is in a very flourishing condition, and we wish it much success during the coming season. With Mr. W. Parker as Captain, Mr. Abraham as Treasurer, and Mr. Riley as Secretary, we think this is assured. We are requested to remind the members that subscriptions become due on May 16th. It has been arranged that this Annual Show shall take place this year on Wednesday, August 5th, in the Jubilee Field. We trust that all who are interested in the Show, especially intending exhibitors, will endeavour to make it a success, though we regret to state that the Committee find that it will be necessary to take the most stringent measures to prevent exhibitors showing products other than those of their own gardens. The School re-assembled after the Christmas Holidays on Saturday, Jan. 16th. There is a slight increase in numbers this term. We are pleased to see that J. H. Glover, an old Appleby Boy, was elected to a Sizarship at Trinity College, Cambridge, of the value of £100 per annum, just before the Christmas vacation. The Clothing and Coal Clubs will re-open this month as usual, and payments will be received at the Girls’ School on the first Monday in each month up to and including November. During the past year our Parish has good reason to be congratulated on the immunity from sickness that it has enjoyed, a blessing the value of which it is not possible to estimate whilst owing to an exceptionally bad harvest and other causes a generally depressed state of things has ensued both in the agricultural and commercial world, yet we must take courage and trust that the dark cloud which has seemed to be gathering more closely round us may be removed during the coming year. At the same time we cannot put out of sight the fact that prosperity can hardly be expected if indifference to religious matters, and a neglect of duty in this respect is encouraged and indulged. A New Year is distinctly a time to make resolutions for good for the future, and to amend the past…. A Concert in aid of Dr. Barnardo’s Homes was held at the Grammar School on Wednesday , Dec. 7th. The programme was long and of varied character consisting of solos, choruses, and dialogues for the most part by children of the National Schools. It was opened by a prologue well and distinctly spoken by Charles Garrod, after which the children sang the “Legend of the Bells” from Les Cloches de Corneville in excellent time and tune. The same may be said of the choruses sung later on, one in character “When I’m grown up” by four children being especially popular. The Musical Drill was performed by the boys with spirit and precision, and Miss Moore and Miss M. Davidson danced a pretty sword-dance, which received a well deserved encore. The Comic Element was well represented by Mr. Mills and Mr. Boss, whose coster songs were vociferously applauded. A duet by Messrs. Mills and Riley, a song by Charles Bates, and Mr T. E. Riley’s “Heaving the Anchor” were well received. The girls are especially to be commended for the pleasant manner in which they expressed themselves in the dialogues. Mr. Riley and those who are responsible for the training of the children are certainly to be congratulated for the perfection to which they had brought the choruses, a result which is only attained by constant and hard practice. The net proceeds amounted to £4 2s. 6d. Mr. J. J. Robinson, of St. John’s College, Cambridge, an old Boy, played in the Inter-University Rugby Football Match on Dec. 14th against Oxford. The match was played in London and resulted in a draw; both sides being unusually strong. Mr. Robinson has also gained a reputation at Cambridge as a fine Cricketer. He is the first known instance of an Apppleby boy “getting his blue” at the University. The School broke up on Friday, Dec. 23rd, and will re-open on Friday, Jan. 20th, 1893. It is with great regret that we have to chronicle an outbreak of serious illness in the parish, more especially amongst children, that has occurred quite at the end of last and during the first two or three weeks of this year. The sickness has now abated, yet it is with deep sorrow we have to record the death of four of our little ones. The anxiety and sorrow have been very acute and much sympathy is felt for the bereaved parents and friends. On New Year’s Day, Mrs. Moore kindly presented to the Parish Church a very handsome Altar Cloth, worked by herself. It has greatly added to the beauty of the Chancel. The Examinations of the Science and Art Department were held under the superintendence of the Local Committee at the School on several days in May, on the 1st Freehand Drawing, the 10th Mathematics, and the 18th Chemistry. Mr. Farmer, the Local Secretary, Messrs. Parker, Tunnadine and Rice kindly gave their services as Superintendents. It is worth while putting on record here a note of the extraordinary weather experienced throughout the country during the last two months. Since the middle of March to this date, May 12th, we have had only four wet days, and even then the rainfall was very slight. The temperature by day has been much above the average for the time of year, and there have been few serious frosts at night. Consequently the spring is more forward than has been known for many years. It is to be feared, however, that the excessive drought is doing serious injury to grass lands and green crops of all kinds; and in many places there is a great scarcity of water.